We all want our journalism to have impact. 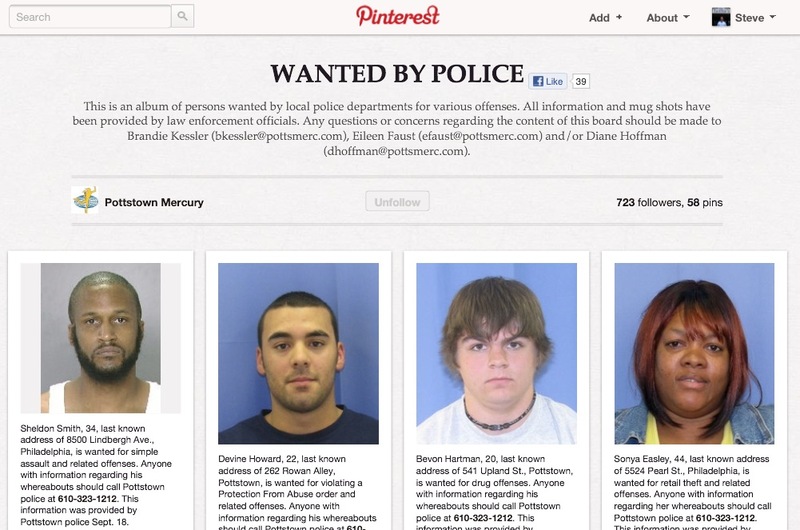 Well, here’s impact for you: the Wanted by Police Pinboard launched by the Pottstown Mercury’s Brandie Kessler is resulting in arrests. In a recent Mercury story, Pottstown Police Capt. F. Richard Drumheller said arrests were up 58 percent since the Mercury started publicizing mug shots of people with outstanding warrants. When Mandy Jenkins stopped by The Mercury a few months ago and told us a bit about various new social media, myself and reporter Evan Brandt thought Pinterest, because of its photo-focus, would be perfect for a wanted by police list. I had put a list together in a slideshow on our website long before the Pinterest board, but the slideshow kept freezing or not working and it was difficult to update and difficult to highlight on Facebook and Twitter. I decided to create a list on Pinterest. It’s great because it’s easy to update, easy to view on a smartphone and you don’t even need a Pinterest account to view it. Plus, it’s simple to post the link on Facebook and Twitter, and our readers love it. Police departments have told me they have made many arrests as a direct result of the Pinterest board, which is pretty awesome. Pinterest is a sort of digital corkboard and is among the fastest growing social media sites in the world. Many of its users use Pinterest to post or “pin” recipes, craft ideas and other things which they can easily organize using the site. However, we’ve found it’s also a great way to display mug shots. Pottstown police department has a public list of persons wanted by their department for a variety of offenses. I created a board using a collection of mug shots of Pottstown’s wanted persons along with a snapshot of what each individual is wanted for. I then posted that “board” to our Facebook page, where more than 6,600 (Buttry note: That number is now more than 7,000) of our readers are able to view it regardless of whether they have their own Pinterest log in. Community Engagement Editor Diane Hoffman demurred to Brandie when I asked questions about this, but I’m pretty sure one of the reasons this works so well is that Diane has built a strong following for the Merc’s Pinterest account, with nearly 800 followers. Diane is one of Digital First Media’s Pinterest rock stars, generating strong engagement with Pinboards about topics such as pets, graduation, prom and brides. That sizable audience clearly set the stage for the fugitive pins to work effectively. We initially had this Most Wanted list as a photo gallery on website but one of advantages of Pinterest board is the view on mobile devices. Far surpasses what reader sees on our site. Nancy has shared the idea with other Digital First editors in Pennsylvania. She reports that colleagues at the Times Herald in Norristown and the Daily Local News in West Chester are planning to start similar Pinboards. When we get several of the local Pinboards going, we’ll create a “regional Most Wanted list” that the mug shots will be repinned to, Nancy said. As a police reporter with The Mercury for the past 6 years, I often find myself asking the police to help me. This board allows me to help the police, which really improves the working relationship I have with them. It’s also great to give the public an opportunity to help improve the quality of life in their community. One thing I hear from the local police chiefs is there are only X amount of police officers on their respective forces, and they would love the community’s help in being more efficient. This board facilitates that. It’s also wonderfully interactive. on September 28, 2012 at 2:10 pm | Reply Pennsylvania police post perp pix on Pinterest - More happy things! | More happy things! Haha this is the most useful board i’ve come across on pinterest.